Best sightseeing seat in town!! 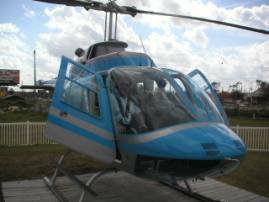 Start your vacation with a panoramic helicopter sightseeing adventure over the attractions. This is something new for the been there done that crowd and for those that relialize you only live once. You will want to share this experience with your family or travelling companions. Max. seat weight 280 lbs. Max. combined weight 580 lbs. "A Thrill Flight" Will give you an experience you'll likely never forget. It's our "fastest" tour of the surrounding area. This flight takes you west towards and over Old Towne Kissimmee. A narrated flight, of the local area. So sit back and relax as you see Florida expanding in front of your eyes. This flight will take you over Old Towne Kissimmee, Disney Hollywood Studios, Epcot Center, and Gaylord Palms Resort. Have your Camera's ready for this one. You will also see the Disney Water Parks including Blizzard Beach and Typhoon Lagoon. We will fly you north over Sea World, Discovery Cove, Downtown Disney, Orlando Premium Outlet Mall, Disney Hollywood Studios, Epcot Center, Disney's Wide World of Sports Complex, Gaylord Palms Resort and Old Towne Kissimmee. We'll wisk you away to Universal Studios Orlando, Island of Adventure, Wet & Wild Water Park, Sea World, Discovery Cove, Epcot Center, Orlando Premium Outlet Mall, Hotel Row at Lake Buena Vista, Downtown Disney, Disney Wide World of Sports Complex, Disney Hollywood Studios, Gaylord Palms Resort and Old Towne Kissimmee.